If you are a peanut butter fan, this bar is for you! I can comfortably make that claim because I served it to a bunch of peanut butter lovers and they all had glowing assessments. One said, "I think you need to add this to your regular repertoire." Another said, "I really shouldn't have seconds but I'll make an exception this once! Darn you, Marni!" And another asked, "When is this going up on the blog!?!?!?!?!" I love that it's a no-bake, stovetop-only bar. 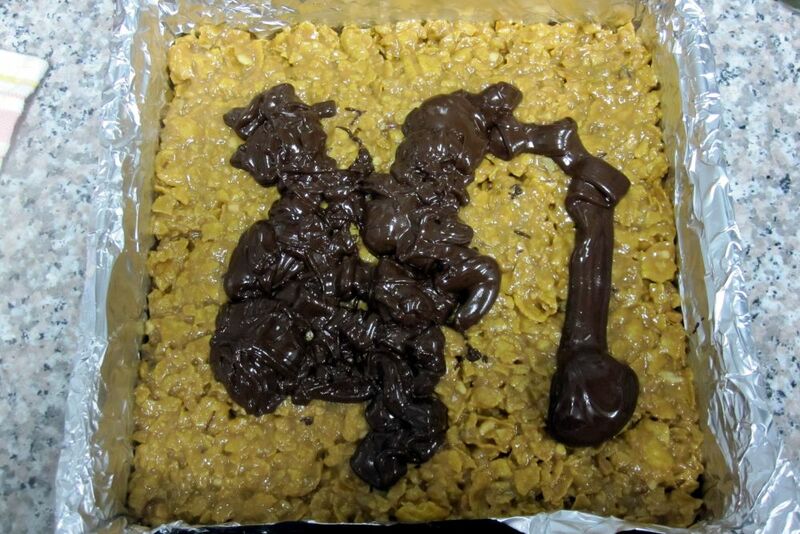 Put a couple ingredients in a saucepan, stir corn flakes in, spread the mixture into a foil-lined pan, and cover with melted chocolate and chopped peanuts. The bars never go in the oven. They just chill in the fridge for a few hours. Easy as pie, er, bars! And if you store the leftovers in the fridge (uhhhh, what leftovers? 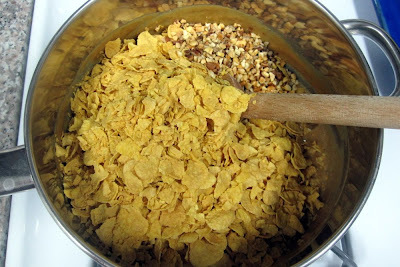 ), the corn flakes seem to stay crispy for days! GREAT SUCCESS! GREAT SUCCESS! Since these corn flake bars remind me a lot of a rice krispy bar, I'm kind of curious to try the exact same recipe using a different cereal next time. Though as they say, if it ain't broke, don't fix it! And these do not need fixing! A+! Shabbat Note: It would be very easy to make these pareve for Shabbat. Simply use margarine instead of butter and use pareve bittersweet, dark, or semi-sweet chocolate for the top layer. Line an 8x8-inch baking pan (or a 9x9-inch but the squares will not be as tall) with foil so that some foil hangs over the edge on two opposite sides (for pulling up the bars later). In a medium or large saucepan over low-medium heat, melt butter. 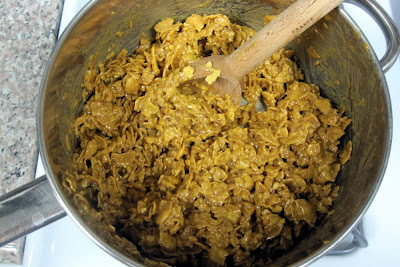 Add peanut butter, corn syrup, brown sugar, and salt and stir until all melted and smooth. Remove from the heat. Stir in corn flakes, 1/4 cup peanuts, and vanilla until just combined. Pour into prepared pan and smooth top with the back of a spoon. 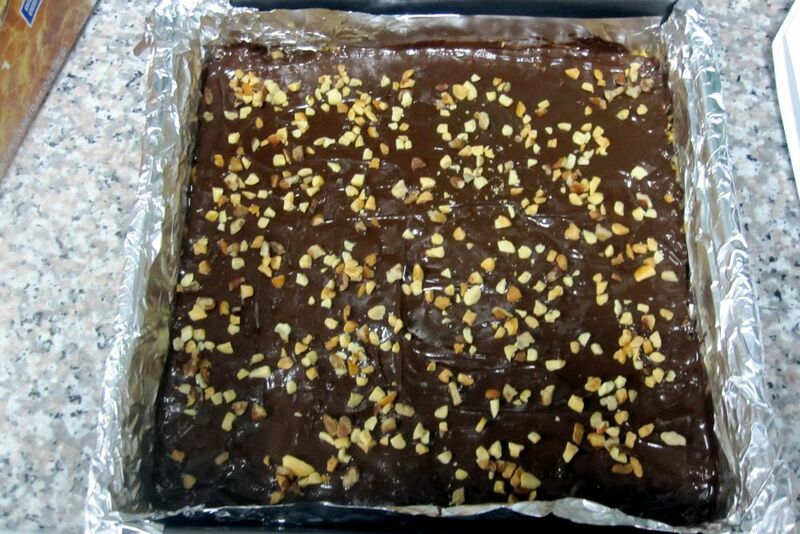 In the top of a double boiler over simmering water (or simply using the microwave), heat chocolate until just melted (if using microwave, be very careful not to burn the chocolate and heat just long enough to warm the chocolate pieces so you can stir them to melt them). Spread chocolate over top of corn flake mixture using offset spatula. Sprinkle with remaining chopped peanuts. Cover and chill until firm, about 2 hours. Remove from pan using the foil overhangs and cut into 2-inch squares. Or if you're like me, cut them into bite size pieces. A little goes a long way! 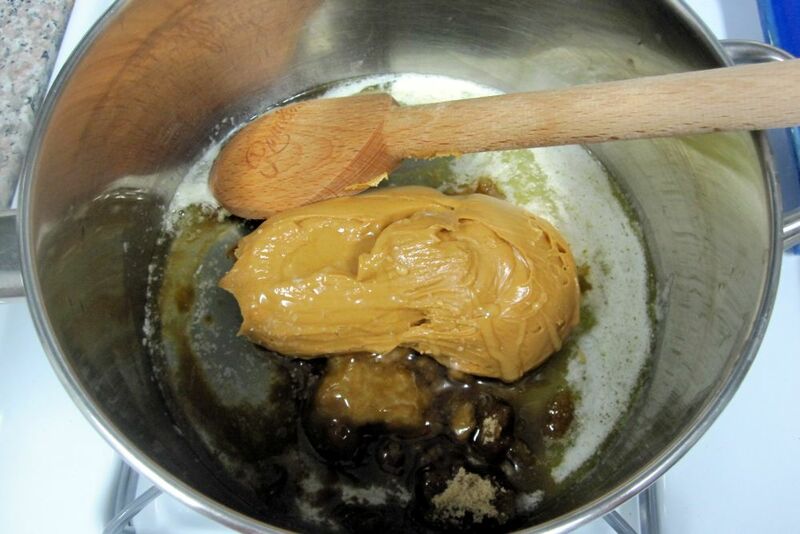 In a saucepan, heat together the butter, peanut butter, corn syrup, brown sugar, and salt. Remove from the heat. Once chilled, slice and serve! i've got leftover cornflakes! wanna try this - although do you think i could use honey/maple syrup or even watered down jam for the corn syrup?